NEW YORK (AP) — New York Knicks point guard Jason Kidd was arrested on a drunken-driving charge after police said he crashed his SUV into a telephone pole in the Hamptons on Sunday, days after signing with the Knicks. Treated at a hospital for minor injuries after the crash, Kidd was arraigned on a misdemeanor driving-while-intoxicated charge and released without bail, Southampton Town police said. Kidd's agent didn't immediately respond to phone or email messages. The Knicks, who signed the 10-time All-Star in free agency this week, had no immediate comment. Kidd, 39, was alone in the 2010 Cadillac Escalade when it hit a pole and veered into the woods around 2 a.m. in Water Mill, police said. Water Mill is a serene, mainly residential community east of Southampton Village. Kidd's next court date wasn't immediate available. The DWI charge carries the potential for up to a year in jail. The Knicks signed Kidd away from the Dallas Mavericks this week in a deal that will pay him about $3 million a year. 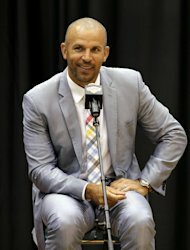 Kidd had played in New Jersey, leading the Nets to two NBA Finals appearances, before being traded to Dallas and remains fond of the New York City area, where his children continued to live. The two-time Olympic gold medalist has been in trouble with the law before. While playing with Phoenix in 2001, he was arrested on a domestic violence charge, acknowledging that he struck his former wife. Kidd is second on the NBA's career list in assists and steals. The Knicks believe Kidd, who helped the Mavericks win the 2011 NBA championship, would be a good mentor to point guard Jeremy Lin if the team opts to keep him. "NY Knicks' Kidd arrested on DWI charge in Hamptons" | Login or Create an Account | 32 comments The comments are owned by the poster. We aren't responsible for their content.